Climate Change. Waste. Urbanising Society. Poverty. Ageing population. Housing. These are all major issues facing our world today. Through Creative Steps 2.0 we want to explore how innovations in creative industries can help reduce or deal with major societal problems such as these. We’d also like to explore broader innovations in the creative industries, but within this how they can be more sustainable, such as applying principles of the ‘circular economy‘. How can innovations in the creative industries help us deal with or lessen challenges facing our society and environment today? Creative Steps 2.0 is an innovation programme funded by a creative momentum project. It brings together emerging talent and existing businesses to develop a new product idea. The programme encourages transnational collaboration between the project partner regions. Following the success of the pilot Creative Steps 2.0 in Finland, we are happy to announce the opportunity for west of Ireland companies to become involved in this initiative. 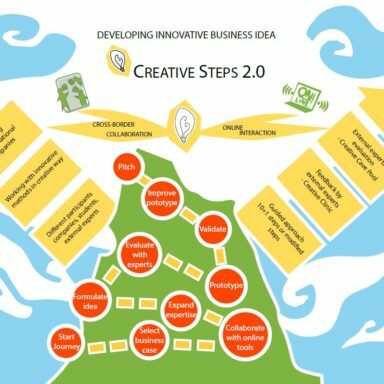 Creative Steps 2.0 will match a business from the west of Ireland and with a business from one of the other project partner regions (Mid-Sweden, South East Northern Ireland, Northern Finland). Matched businesses could be two creative enterprises, or one creative enterprise and one social enterprise/charity with involvement in the creative sector. Ultimately, businesses must be working or seeking to expand their work in the creative sector. In the west of Ireland, Creative Steps 2.0 will take place from early/mid-October to mid November 2017. Business participation is online. Once we have paired two business, up to four students will make up the final crucial element of the ‘Creative Team’. They will develop an idea for a new, or improvement to an existing product, with a view that the two matched businesses can work together to develop this idea into the future, after Creative Steps 2.0 ends. Students will be guided through this process using a combination of workshops, online working and interactive sessions. A facilitator from NUI Galway will coordinate the whole process. 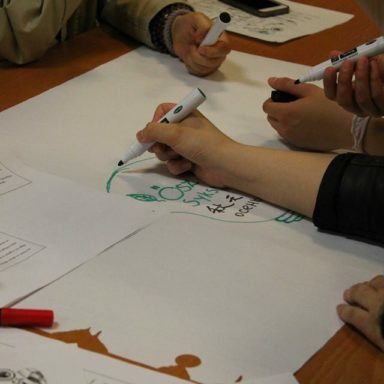 A central element is two day-long workshops held in NUI Galway and led by experts from FABLAB Manorhamilton in design thinking and concept generation. Businesses will participate online at key points during the process. At a minimum, this will be in the initial stage to define the task, as well as at the end when the student team presents the new idea and its prototype. The deadline for applications is midnight, Thursday September 14th 2017. Shortly after the deadline, we will assess applications and select the successful west of Ireland enterprises. We will then open a targeted call in the other partner regions for businesses to pair these companies with.